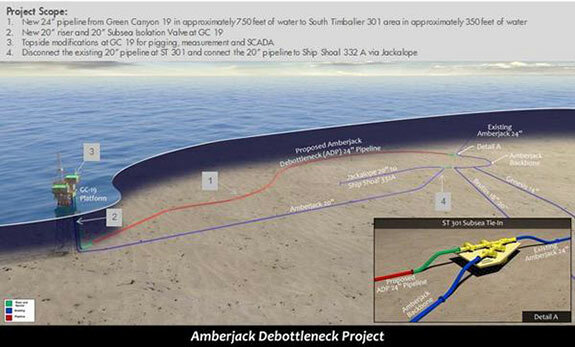 Amberjack Pipeline Company LLC (Amberjack) has recently announced the completion of a debottleneck project. The project installed a 33 mile, 24 in. pipeline segment from the Green Canyon block 19 platform (GC-19) to the South Timbalier block 301 (ST-301) area. The pipeline is designed to connect existing infrastructure and expand the capacity to Fourchon. In addition, it routs the existing Amberjack 20 in. pipeline segment from GC-19 directly to the Ship Sho block 332A (SS-332A) platform via the Jackalope 20 in. pipeline. The debottleneck project increased the GC-19’s off-take capacity by 60%. From GC-19, shippers can remain on the Amberjack pipeline system to the Mars pipeline or the Chevron pipeline to Empire, or connect to other downstream pipelines, such as Poseidon, CHOPS and Eugene Island. Moreover, pipeline and platform facility design and construction work was completed by a blended SPLC and CPL team, each responsible for different aspects of the project. This project required an extensive saturated diving campaign, with over 170 days of safe diving with no unscheduled downtime to the existing Amberjack system. Amberjack is a joint venture between Shell Pipeline Company LP (SPLC) and Chevron Pipe Line Company (CPL). "The safe completion of this project expands our presence in this important Gulf of Mexico (GoM) corridor, allowing increased access that wasn't possible before," said John Doll, President of Amberjack. "This option expands existing infrastructure to eliminate constraints and favourably positions Amberjack to secure future growth in GoM deepwater fields, moving production to key refining markets along the GoM."